"Pirate's Maiden" designed for Tonner American Models. 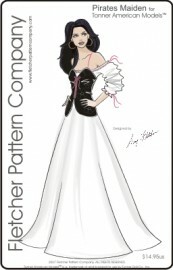 Pattern features un-lined peasant dress with lined modified lace-up corset. This design is also available for 16" Tyler Wentworth. The pdf version prints on A4 and 8 1/2 x 14" legal size paper.